I sometimes browse files on my Android device, for instance after transferring an apk file or other data to the device to execute it. While the default file browser works for that, it is basic and lacks lots of features that third-party file managers offer. Update: Cabinet has not been updated for years. While you can still use it, we suggest you use Amaze instead which is another free file manager for Android. 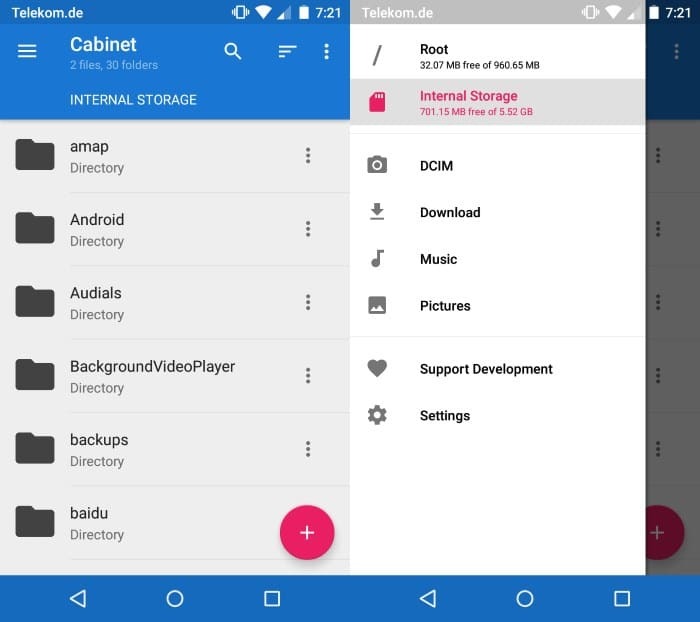 Cabinet is a free file manager for Android 4.1 and up that works out of the box just like the native file browser does on devices running Android. All folders and files of the selected storage location are displayed in the apps' interface by default. It is easy enough to switch between storage locations as that option is provided directly in the sidebar settings menu which you can open from home. The top bar of the app lists search and filtering options. You may change how folders and files are displayed for instance or display only audio or image files for the time being. Navigation is fast and there is almost no delay when you switch to another folder on the device. The handling of files is as efficient. A tap opens it on the device while a long tap displays options to delete it or share it. A tap on the menu icon next to each folder and file on the other hand displays the same and additional file processing options such as moving it, opening it as, renaming it or archiving it which saves it as a zip file to the same folder. The sidebar menu lists favorite folders that you can open quickly from there. DCIM, Download, Music and Pictures are displayed there by default. To add another folder there simply tap on its menu icon and select the bookmark option to do so. Existing bookmarks, even default ones, can be removed from the listing with a long-tap and the selection of delete. A tap on the plus button in the interface lets you create new files and folders on the device and access remote servers using SFTP. If you select the latter you are taken to a configuration page where you enter the hostname, username and related information. There you can also test the connection and once that is done, add it permanently to the app. All remote connections you have configured are available in the sidebar menu from that moment on. Note that you don't have to save the password as you can leave it blank so that you are prompted for it whenever you access the remote server. Folders can be pinned to the homescreen of the device and not only the sidebar. If you are using a folder regularly it may be prove useful. The settings let you change the default color scheme of the application and add or remove certain information from its listings. There you find for instance an option to display the directory count in the file manager which displays how many files and folders are filed under a folder. Cabinet is in beta currently. You may also notice the "offers in-app purchases" notification on Google Play. This is only used for donations currently. 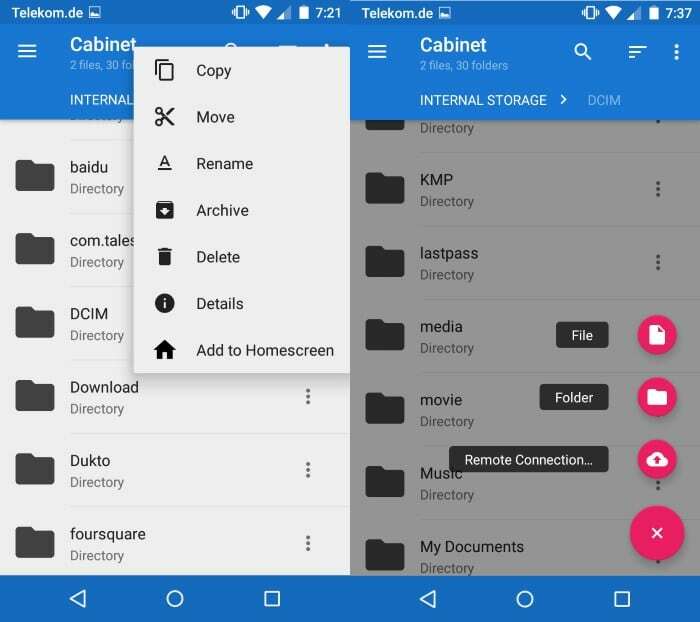 Cabinet is a fast useful file manager for Android. While it lacks some features currently that apps like ES File Explorer support, adding storage locations besides SFTP for instance, it should not be an issue for the majority of Android users. Thanks, I will take a look. So far my favorites are Solid Explorer and Total Commander. Hard to beat. ES File Explorer http://www.estrongs.com/ works fine for my needs. Is there any advantage to Cabinet? Try Mixplorer. It could access your Windows SMB share if you’re connected with the same LAN making it painless to share your file. I like its interface better than ES FE. Nope, SolidExplorer or RootExplorer are the best ones. Amaze file manager (https://f-droid.org/repository/browse/?fdid=com.amaze.filemanager) has the same look and functionality as this one. Its open source too! ES File Explorer for most stuff, including grabbing things from file shares (which makes all those wireless file transfer/explorer apps obsolete), and Root Explorer for going deep. Might try mixplorer or cabinet when I get bored, but ES is so good for general purpose use. Holy LARGE FONT, Batman! TotalCommander all the way! I didn’t like ES File Explorer, wanted something quick and basic. Cabinet is perfect for me. And it’s been a while, so, thanks for your work and service. I use my search plugin for here often and I always find a solution. This app isn’t supported anymore. I use Amaze instead, which does everything Cabinet does, plus a couple things I needed that Cabinet doesn’t. For one, Cabinet wouldn’t let me open an APK, but Amaze will. You can try PC to Mobile Transfer mobile app to mange your files directly from your PC. Excellent tool for moving files from phone to PC and vice versa. I am using it and now I can access my phone’s storage directly from my PC. it works amazingly well.